CHICAGO – In our latest action/crime edition of HollywoodChicago.com Hookup: Film, we have 50 admit-two movie passes up for grabs to the highly anticipated new film “Contraband” starring Mark Wahlberg and Kate Beckinsale! “Contraband” also stars Giovanni Ribisi, Ben Foster, J.K. Simmons, Diego Luna, Robert Wahlberg, Lukas Haas, Jaqueline Fleming, Caleb Landry Jones, William Lucking, Monica Acosta, Michael Beasley, James Rawlings and Connor Hill from director Baltasar Kormákur and writers Aaron Guzikowski and Arnaldur Indriðason. To win your free pass to the advance Chicago screening of “Contraband” courtesy of HollywoodChicago.com, just answer our question below. That’s it! This advance screening is on Tuesday, Jan. 10, 2011 at 7 p.m. in downtown Chicago. Directions to enter this HollywoodChicago.com Hookup and win can be found beneath the graphic below. 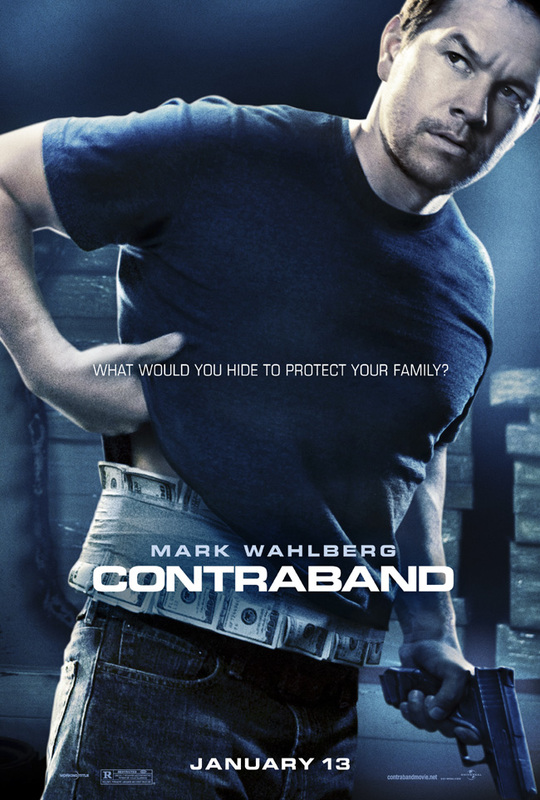 The movie poster for “Contraband” with Mark Wahlberg and Kate Beckinsale. Mark Wahlberg leads the cast of “Contraband”: a white-knuckle action/thriller about a man trying to stay out of a world he worked hard to leave behind and the family he’ll do anything to protect. Set in New Orleans, the film explores the cutthroat underground world of international smuggling. It’s full of desperate criminals, corrupt officials, high stakes and big payoffs. Loyalty rarely exists and death is one wrong turn away. Chris Farraday (Wahlberg) long ago abandoned his life of crime, but after his brother-in-law, Andy (Caleb Landry Jones), botches a drug deal for his ruthless boss, Tim Briggs (Giovanni Ribisi), Chris is forced back into doing what he does best – running contraband – to settle Andy’s debt. Chris is a legendary smuggler and quickly assembles a crew with the help of his best friend, Sebastian (Ben Foster), to head to Panama and return with millions in counterfeit bills. Things quickly fall apart, and with only hours to reach the cash, Chris must use his rusty skills to successfully navigate a treacherous criminal network of brutal drug lords, cops and hit men before his wife, Kate (Kate Beckinsale), and sons become their target. The movie trailer for “Contraband” can be watched now below. What wouldn’t you do to protect your family? This Hookup is simple! Just submit your comment below and we will award 50 admit-two tickets randomly via e-mail for our “Contraband” Hookup. Good luck! Winners need to arrive early as seats are consumed on a first-come, first-served basis. Since advance screenings are overbooked to ensure a full house, winners are not guaranteed entrance and must arrive early. We recommend arriving 45 minutes before the screening’s scheduled start time. Winners are typically e-mailed our advance-screening passes two days before the screening date. HollywoodChicago.com LLC is a promotional partner with the studio and its partners and doesn’t assume any liability for this giveaway. Submitted by JordanaRD on January 9, 2012 - 11:18pm. I’m not sure but most likely if the sitituation came up I am sure nothing would stand in my way. Submitted by nogatco on January 10, 2012 - 7:04am. I would do anything but kill innocent people to protect my family. Submitted by TH (not verified) on January 10, 2012 - 3:49pm. I would do everything I could to protect my family! Submitted by sprinkls on January 11, 2012 - 12:29am. Submitted by GlitzyJen on January 11, 2012 - 1:39am. I would do what I could, but disability would prevent me from doing much. Submitted by bodotlo on January 13, 2012 - 3:36pm. there is nothing that i woiuld not do to protect my family just like in Taken the movie, but I will cross that bridge when I come to it. I hope I never have to go there.